Our philosophy is to live with vision, humor, and joy. 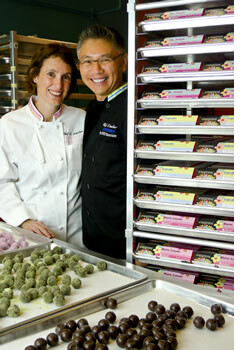 Our vision is of a luxuriously delicious yet down-to-earth line of all-natural, gourmet chocolate truffles. Our sense of humor dictates that we keep it fun & keep it real. Using the best ingredients from the many cultures that make up the new America - and the world. Our passion for living everyday joy - through family, friends & food, through the seasons of each year, and the seasons of our lives. That's the joy infused in our chocolate. The joy that comes from using true vision to find your passion, to live it, and to share it. Because after all, joy is not some big, elusive quest. Joy is life & love, family & neighbors, friends & fudge. Joy is keeping an American tradition like chocolate fudge growing and changing with the times. Fudge happens. Have a ball!